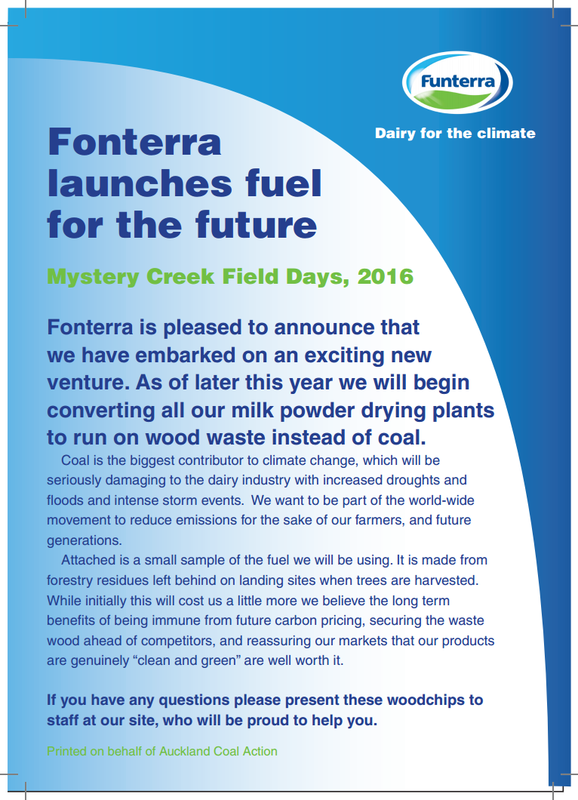 Happening now: Visitors to the Mystery Creek Fielddays are being greeted today with 2,000 fliers announcing Fonterra’s plan to convert all its coal fired boilers to run on “fuel for the future” – wood chip. The material is waste from forestry operations and there are huge quantities in NZ forests which can be harvested, dried and chipped creating hundreds of jobs. Each flier is attached to a small bag of wood chip. If New Zealand is to do its fair share on climate Fonterra must stop burning coal, the biggest contributor to climate change. Auckland Coal Action has been trying to have a conversation with Fonterra about cleaning up its boilers but so far they are not listening. We hope Fielddays visitors will have that conversation too, at the Fonterra tent. Watch this site for developments during the day! It hinged on finding that the adverse effects the residents were concerned about – heath and quality of life impacts from dust, noise, water abstraction and discharge, destruction of landscape values and traffic, would be minor. The residents, of course, disagree but Fonterra could afford lots of expensive expert witnesses to say everything could be mitigated satisfactorily, and these were given more weight than the residents’ concerns. That’s how the RMA works. The residents living closest to the pit generally submitted in favour of the mine after reaching an “arrangement” with Fonterra. This meant the effects on them did not have to be considered, and made it possible to conclude that the effects would be minor. Too bad if those properties change hands during the life of the mine. The panel acknowledged CANA’s expert submission from John Gifford showing that wood waste was available that could substitute for coal in their milk drying plants, making the mine unnecessary. However they decided they didn’t need to consider this further because the mine would do so little harm they didn’t need to think about alternatives. The elephant attended throughout the first week, drawing attention to the legal prohibition on arguing what really matters – the contribution of the mine to climate change. 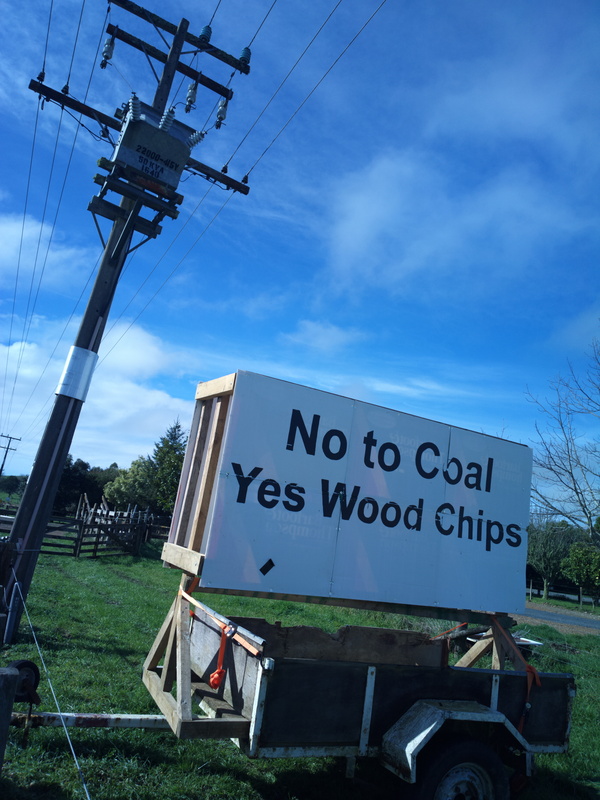 While we didn’t stop the consent, CANA believes the effort was well worth while as thanks to the help of John Gifford we now have a well researched piece of work that has not been challenged showing the feasibility of wood waste as an alternative to coal. Fonterra’s evidence showed that they have already done some work on alternative fuels and we are confident that faced with this evidence, they will eventually have to continue down this path. Auckland Coal Action will be meeting 4.00 pm this Wednesday 16th, outside the main entrance to the Maidment Theatre, Auckland University Quad, Alfred St to deliver wood chips to Fonterra’s Headquarters in Princes St to protest the likely approval of Fonterra’s new mine at Mangatangi, 50km south of Auckland. Coal is one of the dirtiest fossil fuels and leading climate scientists have stated that coal usage must be phased out as soon as possible in order to prevent catastrophic global warming. Fonterra plans to open a new mine to continue supplying coal to its existing operations in the Waikato, even though wood waste is a viable alternative. Fonterra and other companies have sat on their hands for twenty years and the need for action is now extremely urgent. 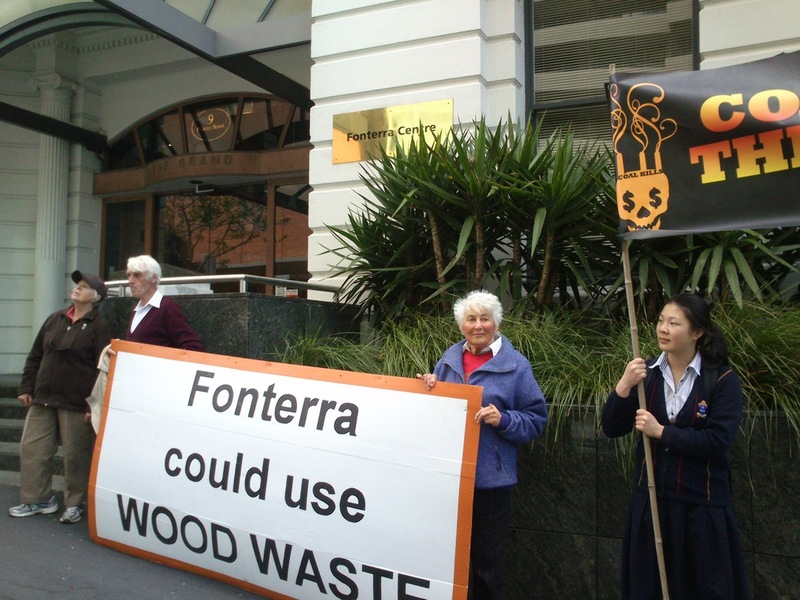 Join us to deliver the message: Fonterra must commit to wood waste now! Can we trust Fonterra and Glencoal? When Auckland Coal Action’s Geoff Mason found out about the proposed new coal mine at Mangatangi, he set off by bus and bicycle to investigate Fonterra’s mining and coal burning operations. He found that Fonterra and its mining subsidiary Glencoal were not meeting their own environmental standards and, in some cases were even breaching the conditions of their resource consents. At the Mangatangi Mine hearings last week, he reported his findings to commissioners. 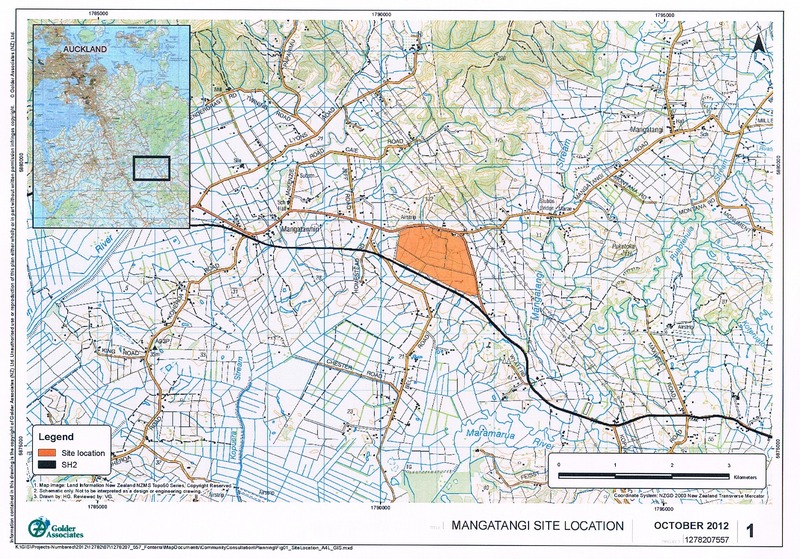 Glencoal is applying for resource consent to open a new coal mine at Mangatawhiri in the north Waikato (called the Mangatangi Mine). The mine is intended to replace the expiring Kopako 3 mine and will supply coal to Fonterra dairy factories for use in their boilers. Coal burning dangerous for the climate, is it also dangerous for coal mining communities? Because the coal is there under the ground it is a waste to not mine it, is the train of thought. The consequence of extending this logic is that in a hundred years’ time the landscape of this area will be dotted with craters where there once was farmland. If extended globally we will have a near 4 degree Celsius temperature rise by 2100. However, is it also harmful for the local communities living around the Waikato’s coal mines and coal-burning factories? Geoff reasoned that a look at Fonterra and Glencoal’s current practices should give us some idea of what to expect from a new mine, and what he found was far from encouraging. Can we trust Fonterra and its subsidiary, Glencoal? Auckland Coal Action’s observations have led us to believe we can’t. Coal ash is a product of burning coal in Fonterra’s factories. It is returned to Kopako 3 mine for disposal. Fonterra has said that it transports this coal ash from its factories using covered trucks. It has also said that sprinklers above the coal delivery area at Waitoa Dairy Factory are used to wet down the coal dust when necessary. 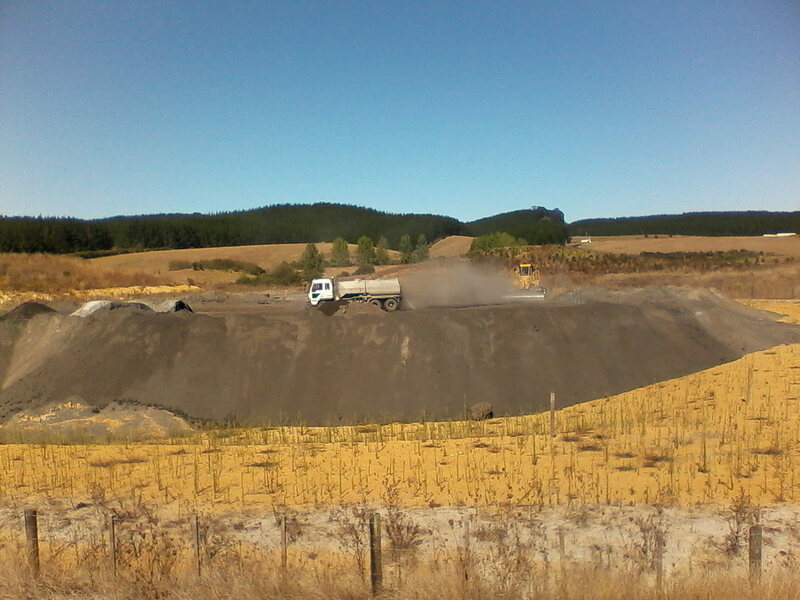 However, this photo taken in December of last year shows an uncovered coal ash truck leaving the Waitoa factory, kicking up coal dust from the coal bunker to the left. On visits Geoff made to Kopako 3 he was able to observe breaches to these standards. Geoff observed an uncovered coal ash truck arriving at the coal ash dump. It kicked up coal ash dust due to lack of consistent watering of the ash pile. Windblown dust from a very dry coal ash pile. Geoff had reported his observations to local Mangatawhiri residents at a public meeting on the 7th. When he visited the mine on the 11th, it seemed that Glencoal became aware they were being watched and attempted to prevent dust from being kicked up by an ash truck that was due to arrive later in the day. On March the 11th after the meeting I observed two covered ash trucks arrive. I also observed this coal ash dust cloud being kicked up from the coal ash dump after a watering truck attempted to catch up on neglected watering. Below is a sequence of photos of the dust cloud that occurred over two minutes. Watering truck only succeeds in kicking up dust from the pile of coal ash. Rising plume of dust above coal ash pile. The dust plume reaches its peak. Why should we believe that Glencoal will water around their coal piles at the Mangatangi mine or cover their trucks as they say they will? Are the residents of Mangatawhiri and Mangatangi going to have to be constantly checking up on Glencoal to get them to follow the consent conditions for this mine? The wind was picking the ash up off the dump and blowing it way up in the air. It would have been blowing horizontally for miles. The wind on that day was blowing the dust roughly in the direction of the houses on Kopuku Rd. Map showing the direction dust was travelling towards properties downwind. On 23 March, Geoff further observed a dump truck in the backfill area kicking up a dust cloud twice the height of the one in this video. Footage was taken at the Kopako 3 restoration area. 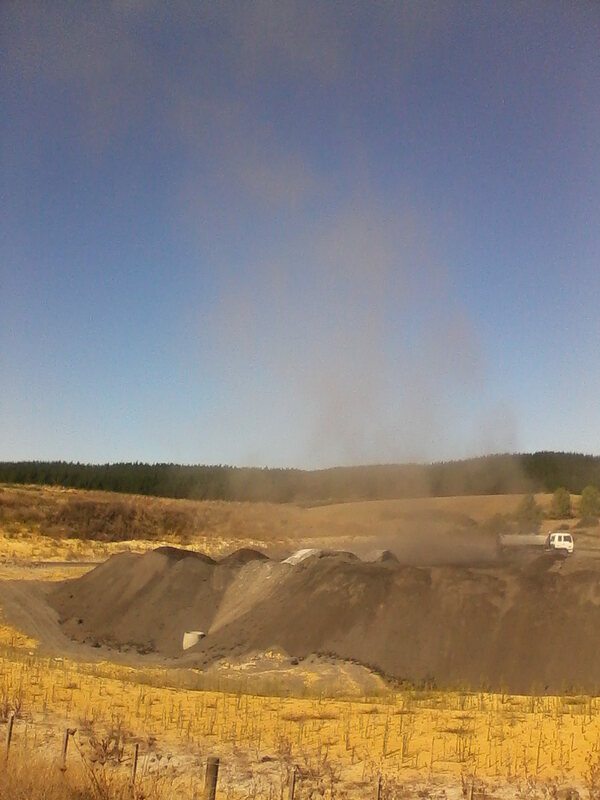 If dust emissions do exceed allowable limits, the company is required to submit an incident report to the Waikato Regional Council within five days. Geoff was able to find no such report in Council files. 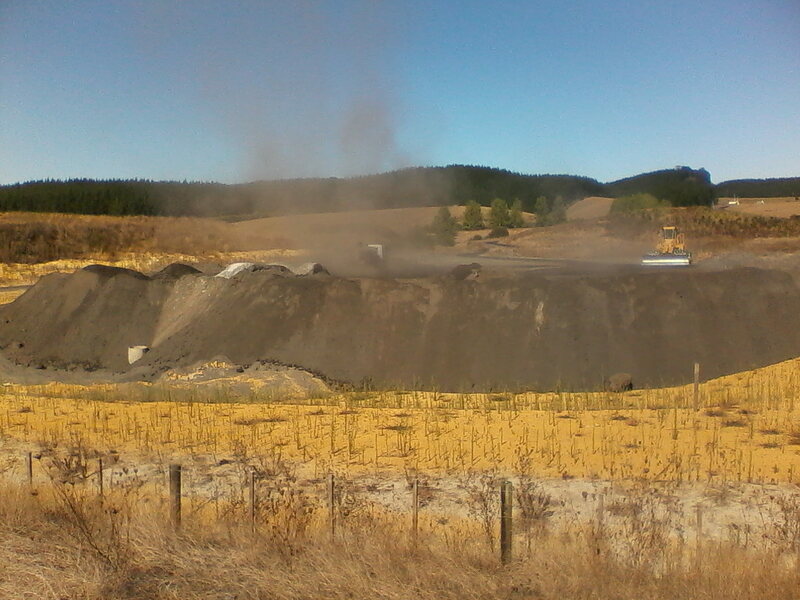 During Glencoal submissions in favour of the Mangatangi Mine, they consistently emphasised their standards for strict environmental controls of dust. Geoff is not confident that these will be followed. His research has also led him to be concerned for the quality of water being discharged from the mine. The evidence on water treatment given in the first week of the hearing stated that based on a review of the water treatment plant operational records, treated water consistently meets the required discharge standard for turbidity. What was conveniently omitted was that Council records show that in April this year the levels of boron in the discharge from the K3 water treatment plant reached 10.8g/m3, exceeding the 10.00g/m3 limit. As a result of this Glencoal were inquiring about applying to irrigate their farmland with the polluted boron rich waste water next summer. Geoff has since found that another expert had the cheek to include a graph of boron levels between 2005 and 2012, but omitted 2013 readings. From Fonterra and Glencoal’s past record, we don’t trust that Glencoal at a later date will not apply to the council to have consent conditions relaxed. I have found three occasions where Fonterra or Glencoal have successfully applied or submitted to have air quality regulations relaxed. In 2009, Fonterra successfully applied to the council for an increase in the particulate emission limit for the coal-fired boiler at Te Awamutu from 50 mg/m3 to 100 mg/m3, due to difficulty complying with the 50 mg/m3 limit. The health of the people of Te Awamutu was compromised so that Fonterra wouldn’t have to upgrade its dust removal. In 2007 Glencoal successfully applied to the council to reduce the level of reporting on air quality and to remove conditions requiring quantitative monitoring by way of despositional dust gauges at K3. We strongly oppose this resource consent! Auckland Coal Action strongly opposes resource consent being granted for the Mangatangi Mine at Mangatawhiri. Our main concern is that most of the known coal reserves must stay in the ground to avoid triggering runaway climate change. However, Geoff’s observations have shown that coal mining and burning is far from safe for the neighbouring communities of such operations. Even if strict conditions are laid out for the control of dust for this mine, locals can have little faith that conditions will be followed. There is also no guarantee that conditions will not be later relaxed. This mine should not go ahead. 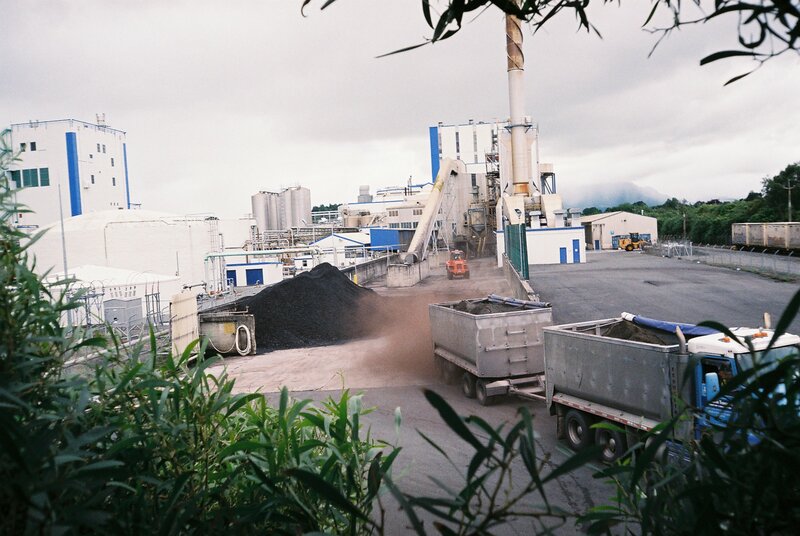 “Fonterra has repeatedly broken its consent conditions when handling coal and ash at its existing Kopako 3 coal mine and Waitoa dairy factory, says Auckland Coal Action. Giving evidence in the second week of the hearings on the proposed new Mangatangi mine, spokesperson Geoff Mason showed photos of dust clouds at the mine and of uncovered coal ash trucks. Fonterra has said they cover these. That visible dust should not be in the air beyond the boundary of the mine. 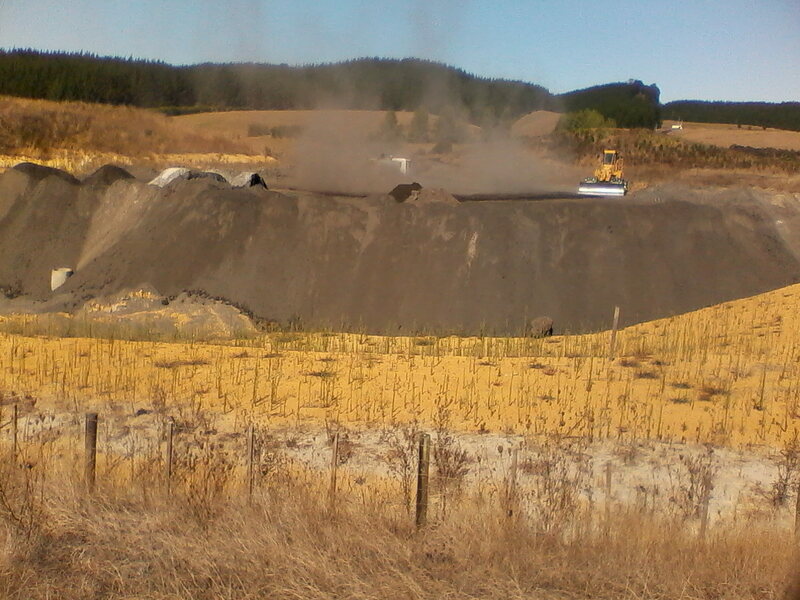 That coal dust is wet down in the storage area at the Waitoa factory when necessary. He also said that Fonterra’s application had stated that their treated mine water at the Kopako 3 mine consistently met standards for cloudiness, but failed to mention that water boron levels had exceeded limits recently. “Why should we believe that Fonterra will observe any conditions set in relation to this mine, when they haven’t been keeping to their word with the old mine? said Mr Mason. “Furthermore we can show that they have three times successfully pushed for reduced dust control standards.” That raises the question of whose interests the council is trying to protect. It is a further worry is that any consent conditions for the Mangatangi mine will be removed later by the council with no right of hearing by submitters. Auckland Coal Action is supporting local residents opposed to the mine and called expert evidence on the dust problem likely to be cause by the mining. Their expert witness stated that Glencoal should monitor background dust for at least 2-3 years before that mine starts, so as to get meaningful data on background dust levels. Glencoal is planning to monitor background dust for only a month. Orientation Week seemed a good time to stage a bit of street theatre outside Fonterra’s HQ just down hill from Auckland University. 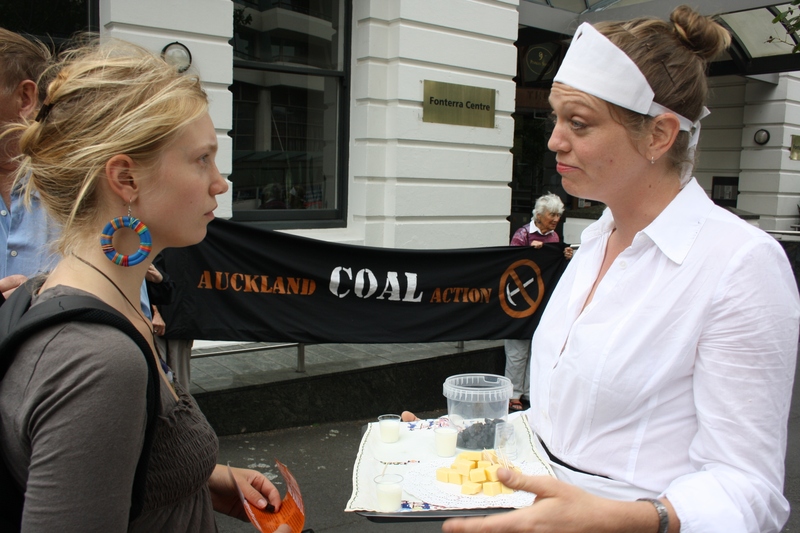 Four waitresses in frilly white aprons and caps offered passers-by (mainly students) samples of Fonterra milk and cheese – then popped a piece of coal on top. Do you realise your cheese comes with coal? It was a great conversation starter about the proposed new coal mine at Mangatawhiri and how Fonterra could use wood chip in its dairy factories instead of coal. Most people agreed, and most were horrified, having no idea that Fonterra was such a major coal burner. A sample of Fonterra’s products. Police question the intent of our waitresses. Coal in my cheese? Yuck! Would you like yours with or without the coal? On the doorstep of Fonterra’s head office. 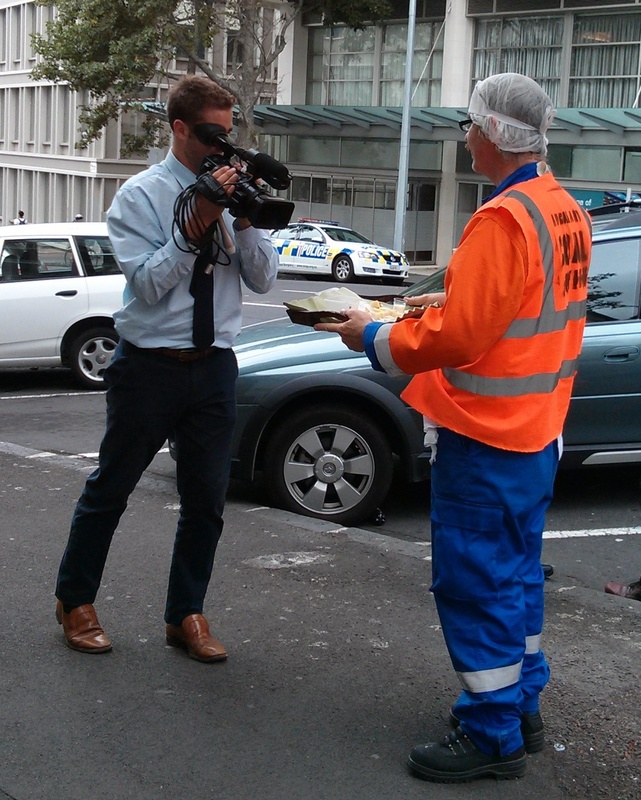 Police were out in force, obviously called by Fonterra who found a few milkmaids really scary. The cops looked a bit embarrassed about being there at all. Also, interested in the action were a number of media outlets. Waikato Times did a preview, Radio BFM did an interview, a rural TV programme turned up and the NZ Herald’s Elements environmental supplement ran a piece too. 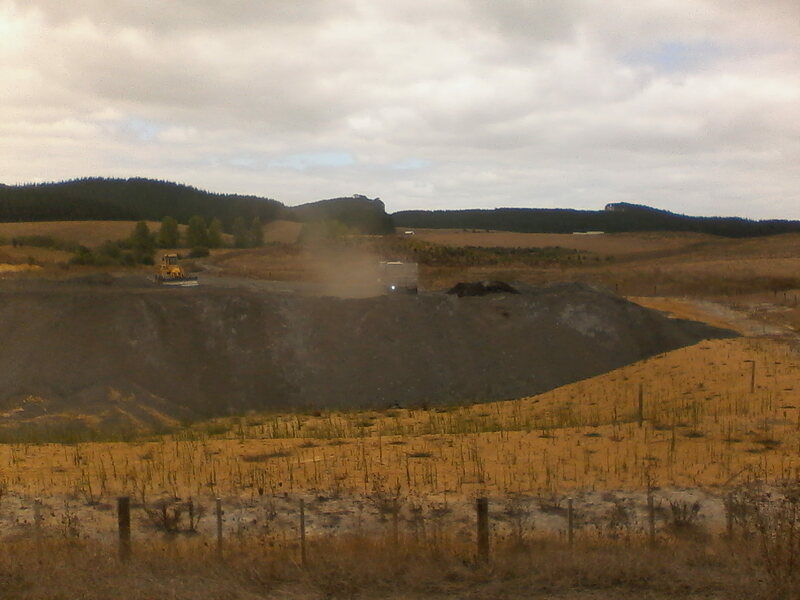 Glencoal, wholly owned by Fonterra, has applied for consents for an open cast mine on farmland at Mangatawhiri on SH2. It’s not an easy place for them as it would be highly visible to anyone driving from Auckland to Tauranga or the Coromandel. Planned to produce 120,000 tonnes a year, it would take over from the Kopako 3 mine which currently supplies the dairy factories at Waitoa, Hautapu and Te Awamutu. With the Kopako coal running out in 2014, it’s a good time to start the phase out of coal in favour of waste wood which is locally available. 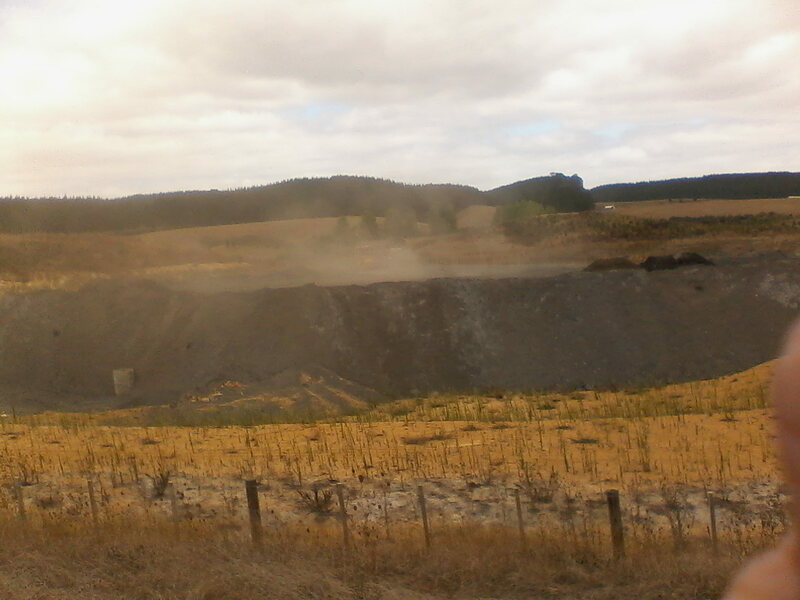 Local farmers and residents are not overly happy about living next to an open cast mine and a public meeting has been organised jointly by local people and Auckland Coal Action for 7 March. Locals will hear Jim Salinger speak on the expected impacts of climate change on farming in that area, as well as speakers on the health effects of coal mining and how to make a submission under the RMA on the consent hearing.